Cross-border e-commerce is increasing sharply in Korea. This is not surprising given that the country ranked No.1 in the world in terms of Internet connection speed at the beginning of 2015, and that the Korean economy is extremely dependent on foreign trade. However, the increase poses a number of challenges to the Korea Customs Service (KCS) which has, since 2014, been taking various e-commerce measures accordingly. This article gives an overview of the scale of e-commerce in Korea, its impact on tax revenue, and how the KCS is promoting e-commerce and managing the risks around this growing form of trade. The volume of imports resulting from e-commerce has been growing continuously in Korea over the past few years. Statistics show that there were 7,941,000 transactions in 2012, 11,155,000 in 2013 and 15,530,000 in 2014, indicating an approximate annual increase of 40%. Korea’s largest e-commerce partner is the United States (US), accounting for more than 70% of overall imports for the last three years – 79% in 2012, 75% in 2013 and 73% in 2014. However, origin countries are diversifying, with 19 countries listed in 2010 and 38 in 2014, and the number of e-commerce transactions originating from these countries is constantly increasing. Most e-commerce goods are delivered by either express cargo service or express mail service (EMS), under procedures which differ according to the status of the service provider, as well as the value of the goods being traded (see Tables 1 and 2). Korea has a tax-exemption system and simplified Customs procedures in place for low-value goods. 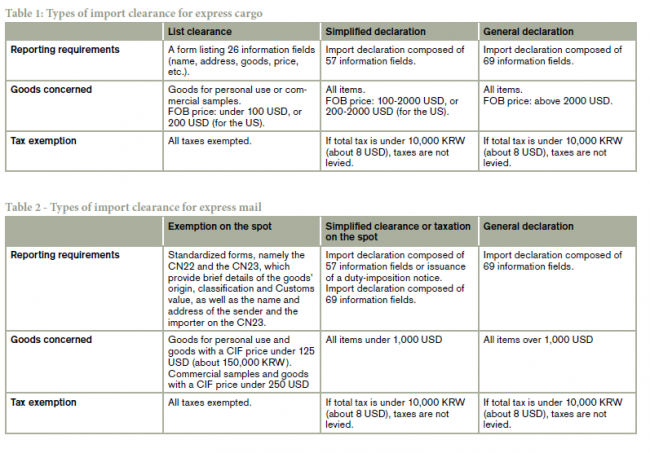 as a ‘reporting’ threshold for goods in respect of which a full Customs declaration must be submitted: for express cargo, a ‘list clearance’ procedure allows a trader to receive goods and, providing their value is below the de minimis threshold, clear them by submitting 26 pieces of information, such as trader’s name and address, consignee’s name and address, and type and price of the goods; as for goods entering via the international mail channel, they are cleared on-the-spot. About 96% of e-commerce transactions benefit from the tax exemption system. Only 0.3% of transactions consist of high-value goods that exceed 1,000 USD, but these imports are growing at a high rate, with an eight-fold increase from 2010 to 2014 indicating that the number of Korean consumers buying high-end goods online and paying duties is on the rise. As most e-commerce products are being imported under the tax exemption system, the current increase in such transactions results in lower tax revenue. In 2014 for example, 15 million goods worth 1.2 billion USD were imported, representing a loss in terms of tax collection of 230 million USD. Although this amount is important, it represents only 0.4% of Korea’s total tax revenue. In the view of the KCS, the importation of e-commerce goods under the tax exemption system enables consumers to buy products at a more ‘reasonable’ price, as the system eliminates price bubbles, such as ‘rent-seeking’ behaviour, caused by monopolies on imported or domestic goods. In this regard, the KCS has been making various efforts to facilitate e-commerce activities. Measures have been taken by the KCS to streamline the import and export process for goods bought online. To facilitate the utilization of the convenient ‘list clearance’ procedure, the KCS has extended the types of goods covered by this procedure from six categories (clothes, shoes, etc.) to all goods, excluding food and medicines related to public health and safety. In addition to the tax exemption, the KCS is also providing a swift clearance process for e-commerce goods. For example, according to data extracted from the automated e-clearance system (UNIPASS), on average it takes only 4 hours to complete the Customs clearance of expedited cargo under the list clearance procedure. Given the characteristics of e-commerce goods, which are wide in variety and low in value per transaction, the KCS created a Simplified Export Declaration for e-Commerce, significantly reducing the information items on the export declaration from 57 to 37. Moreover, to address the difficulties experienced by exporters, who must fill out many export declarations as a result of the large numbers of sales, the KCS will be setting up an e-commerce export platform, which will be able to convert details of orders and sales of online retailers into export declarations automatically. This platform will be connected to UNIPASS, the Korean e-clearance system. To make things more convenient for exporters who are not familiar with international trade and the associated procedures, the KCS now offers a Harmonized System (HS) Navigation Service. Users can find the correct HS code which has to be used in export declarations by searching for the actual name of the goods. The KCS has also begun to keep official records of e-commerce exports conducted via the international mail channel, and to issue ‘certificates of exportation’ in order to enable exporters to enjoy certain benefits, such as a trade finance facility and VAT refunds. For those not familiar with the term, the ‘trade finance facility’ is a loan offered by banking institutions to exporters or importers who are able to prove that they handle a certain volume of transactions. Trade facilitation and trade security are closely linked. Amid the continuous increase in e-commerce transactions, the KCS is enhancing its monitoring and risk management capacity in order to prevent illegal goods from entering the country. At present, X-ray inspections of expedited cargo and international mail are conducted by the KCS on a 100% basis. Postal operators and couriers are obliged to send information requested for clearance electronically, in order to permit the pre-advice and possible pre-clearance of items. To do so, postal operators use the electronic version of the CN 22 and CN 23 forms developed by the WCO and the Universal Postal Union (UPU). All information on the packages selected for inspection, such as the X-ray image and the data contained in the form used for clearance, is loaded on the computer screen of the Customs officer handling the inspection. The KCS has enhanced its monitoring of express delivery service providers. Penalties are imposed on those who submit false declarations. In 2014, the KCS also implemented a measure that obliges delivery service providers to report the actual destination of express cargo to the KCS once delivery is complete. The objective is to prevent the misuse of the de minimis facility by way of vendors splitting consignments in order to wilfully take advantage of the tax exemption system and the simplified procedures for low-value goods. Since 2014, about 20 delivery companies have been fined for failing to provide information on the actual destination of cargo, and nine cases of ‘separated entry of cargo’ have been uncovered, most of which were combined with identity theft and changes to cargo destination. The KCS is of the opinion that accumulated data on actual destinations could be more widely utilized for risk management purposes, particularly during Customs audits and investigations. Lastly, for small and medium courier companies which do not have modern facilities, the KCS is building an ‘Express Cargo Logistics Center’ with a total floor area of 36,000 square metres, at the Incheon International Airport cargo terminal. Its construction will be completed in the first half of 2016. This Center will be equipped with the latest facilities, including automatic sorting machines, an integrated X-ray reading room, etc. It is expected that the Center will assist with the risk management of express cargo, as well as facilitating clearance procedures.